Firm – Gubelin Ltd., Lucerne. Project Head – Frank Lottenbach. Enameler – Mr. K. Pfleghart. The two massive matching circular cases have steel sub-frames to which all the decorative components are affixed. 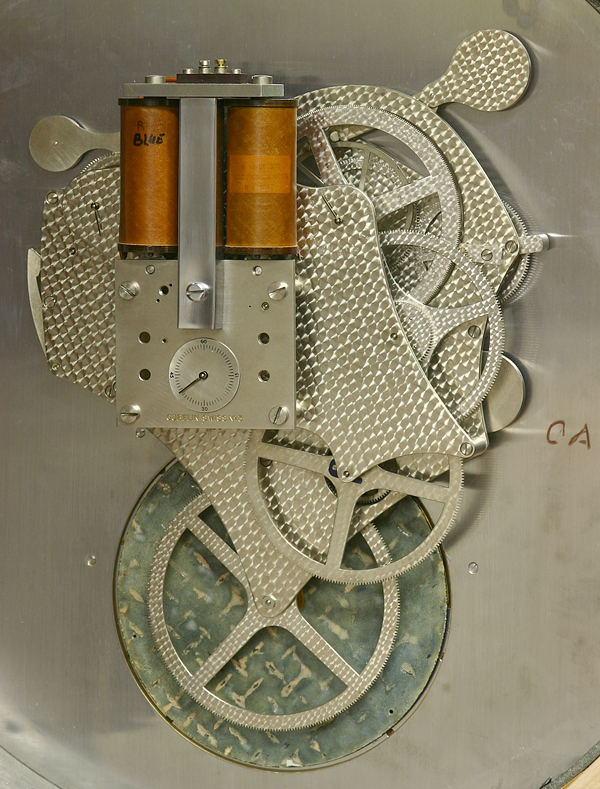 The gilt-aluminum glazed bezels are held in position by multi-point key ways and can be quickly removed to afford access to the dials. 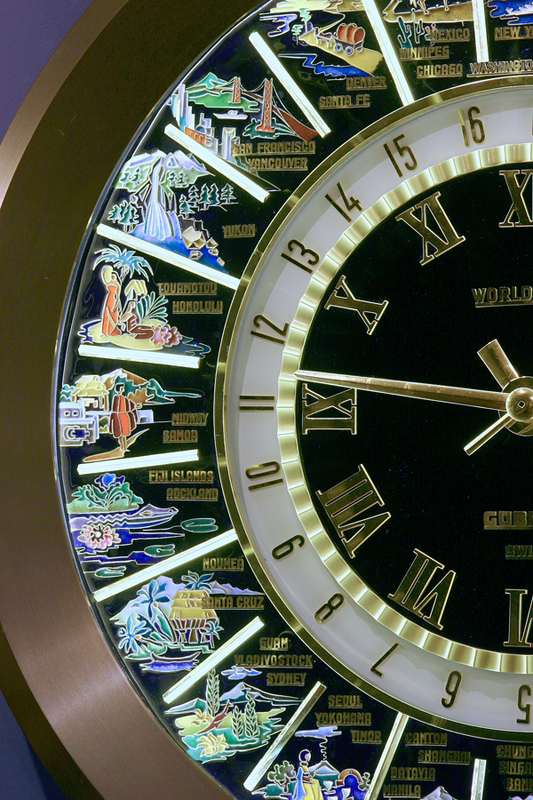 Clock Dial: The large multi-piece black enamel dial has the local time in the center with gilt-bronze hands, Roman numerals for the hours, a scalloped seconds chapter and is signed ‘Gubelin, World Time and Swiss’. 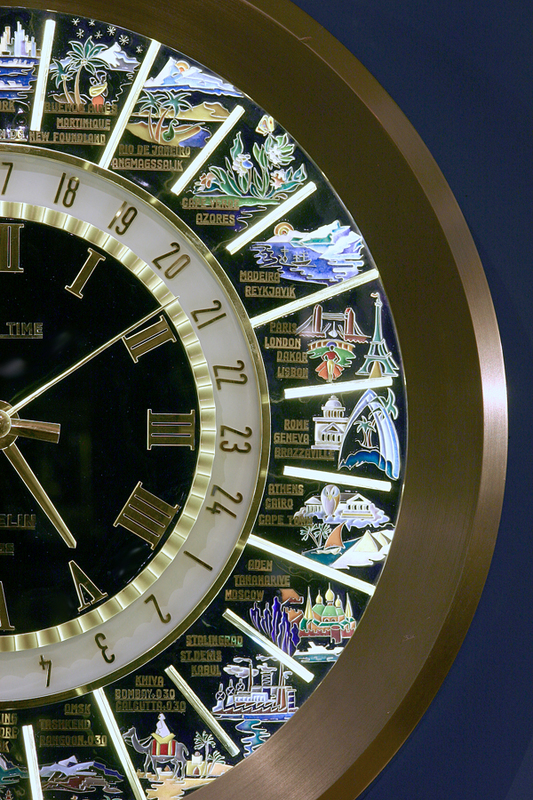 Revolving around the time dial is a white 24-hour chapter with gilt-bronze Arabic numbers. The outside border is divided into 24 segments, each representing a different meridian and subsequently a different time zone. 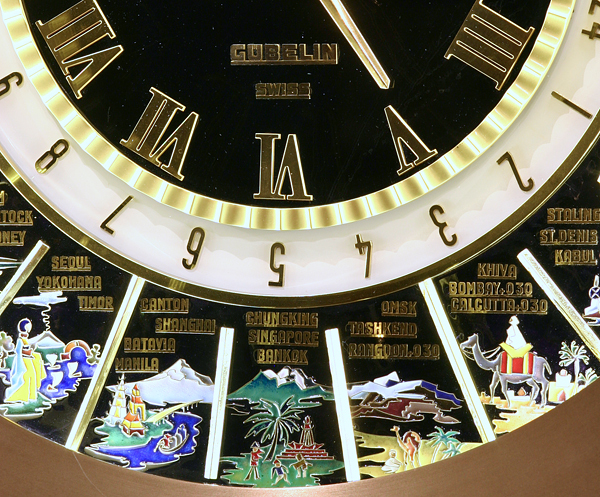 They are decorated with polychrome enamel scenes that represent the cities listed under each time zone. Calendar Dial: The large multi-piece enamel dial has a large gilt bronze center sweep calendar hand that shows the date against a white chapter with the days of the month in gilt-bronze Arabic numbers around the outside edge. 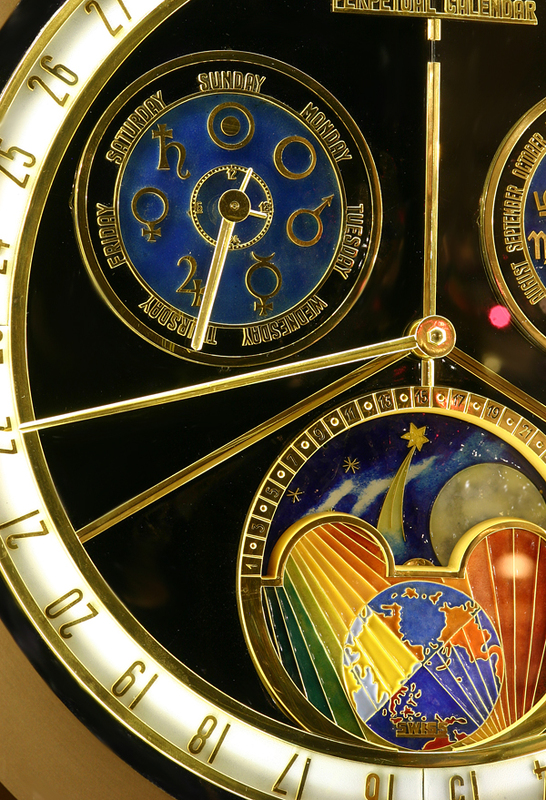 The center is labeled ‘Perpetual Calendar’ at the top and is divided into three segments each with a subsidiary dial. 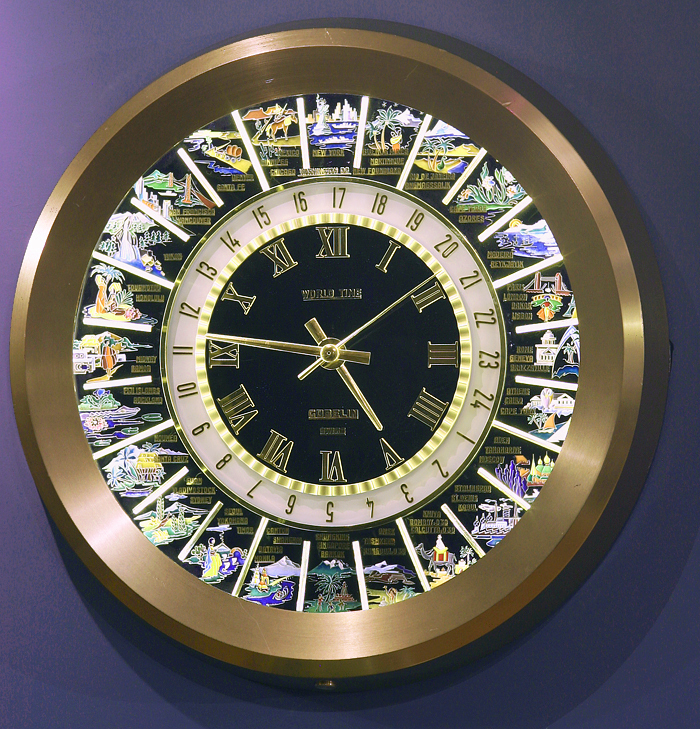 The first segment has a blue center and shows the days of the week with the appropriate zodiac symbols and also has a 24-hour clock. 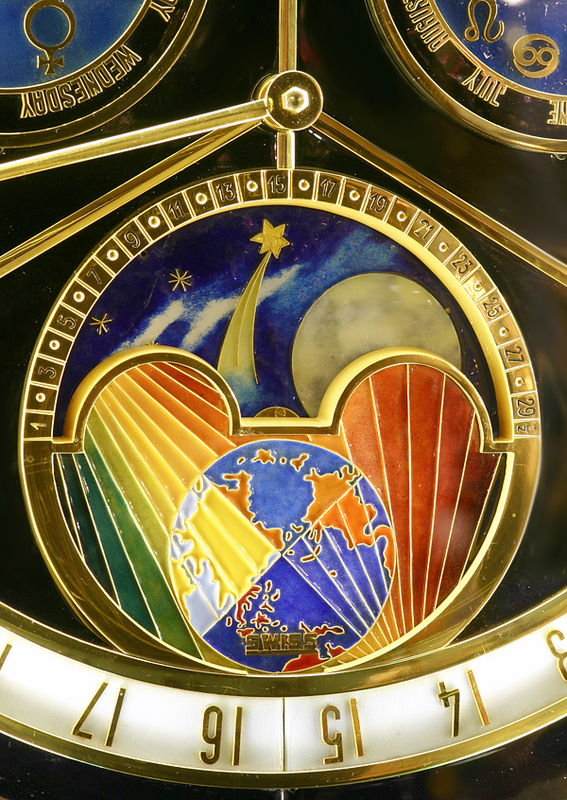 The next also has a blue center and shows the month again with the appropriate stylized zodiac symbol. 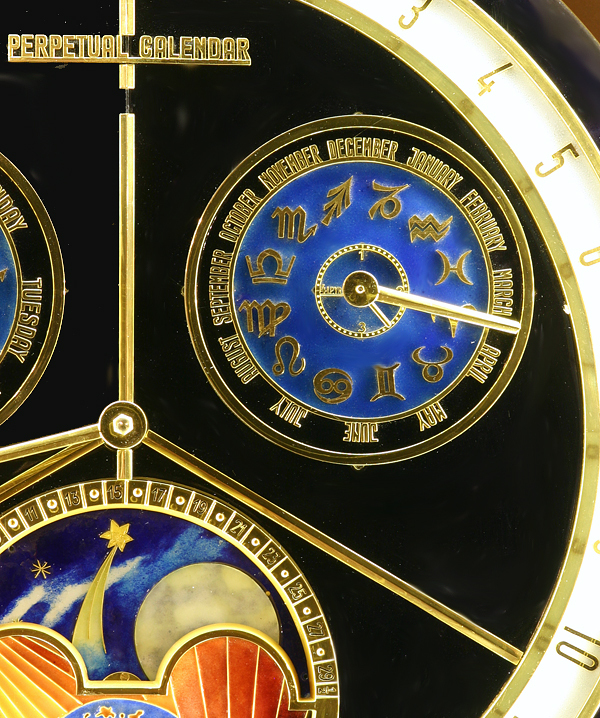 Below is the 29.5-day moon dial with a polychrome enamel decorative field and a rotating disc with stars, clouds, comets and the moon. 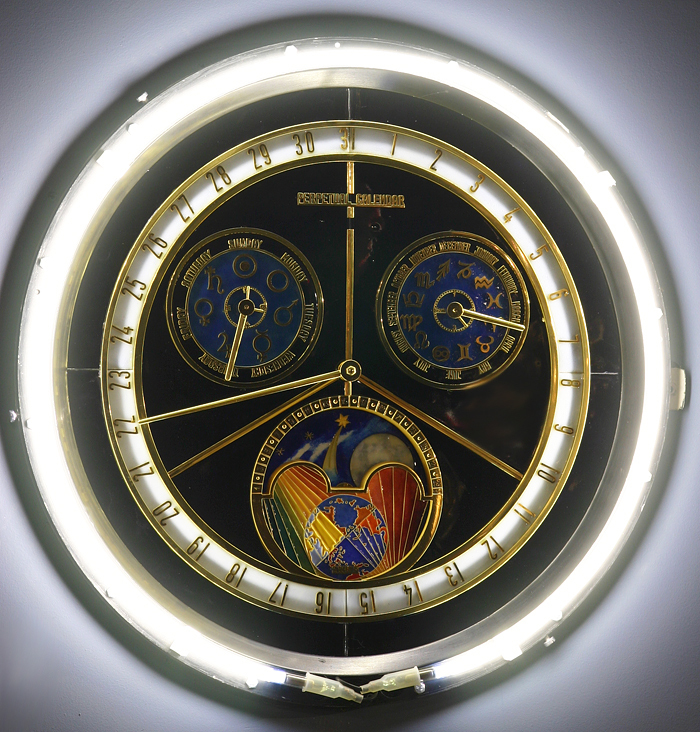 Each of the dials is illuminated by a white neon bulb that is concealed by the bezel and is powered independently of the clock movement. 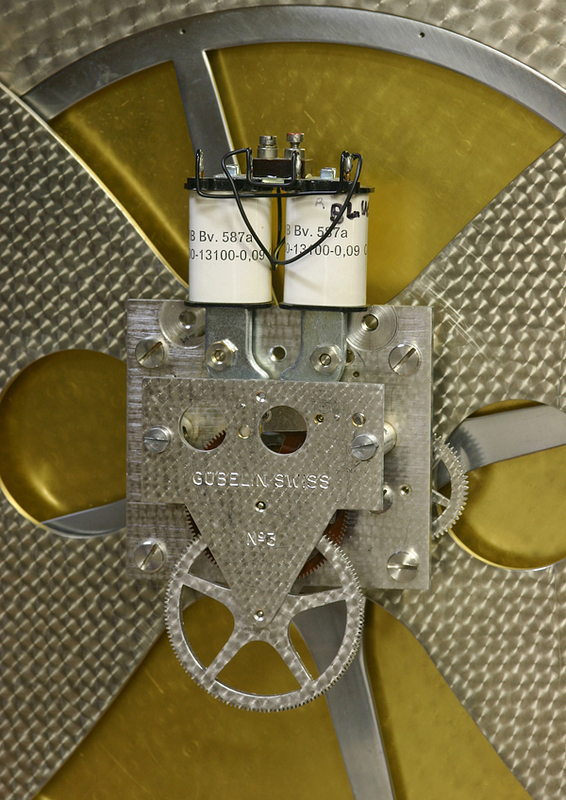 Both the clock and calendar movements have extremely precise, elaborately damskeened gear trains, small subsidiary dials on the back-plates that show the positions of the main dials and glazed aluminum dust covers that have the remnants of a lighting system. All this would seem to indicate that the backs, as well as the fronts, were meant to be displayed. 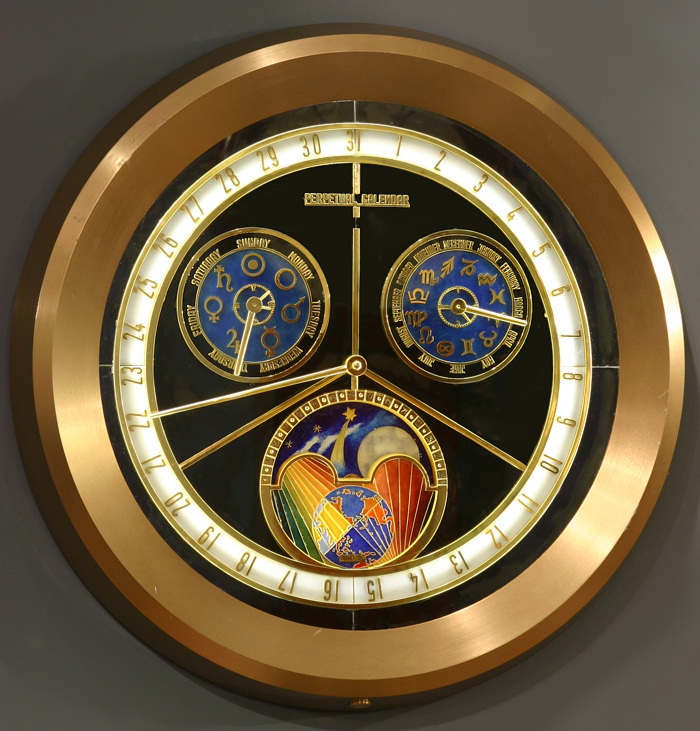 Originally there was a master clock that just provided impulse to the two movements, but in 1990 the owners had Gubelin fit a new master clock with memory-time keeping in case of power failure so a Moser-Baer microprocessor master clock now controls the two pieces. 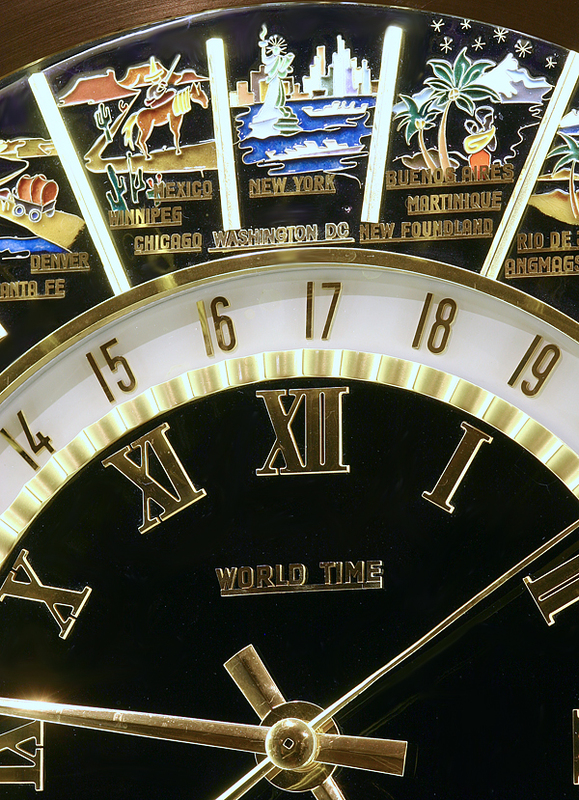 This World Time and Perpetual Calendar pair is only one of three examples ever produced. The other two examples are owned by Gubelin and are displayed in their offices in Lucerne and at their retail premises in Geneva. 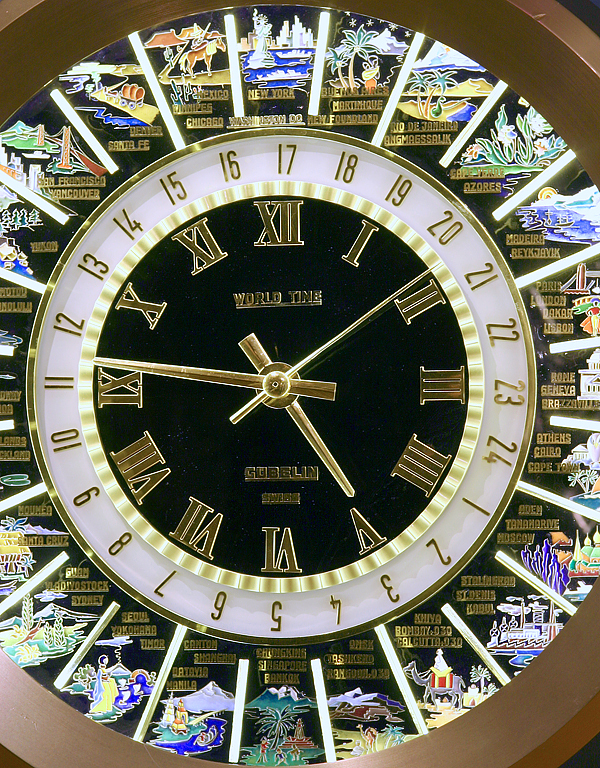 Since each set of clocks was custom made for particular cities the city where they are and subsequently that meridian is centered above. This pair was originally made for Harry Taylor to be installed in the offices of Frank H. Taylor & Sons in East Orange, NJ. Mr. Taylor was friends with the two sons who ran Gubelin in the 1950’s and used to vacation with them on skiing holidays. He saw the examples located in Lucerne and convinced them to make a pair for his real estate offices. 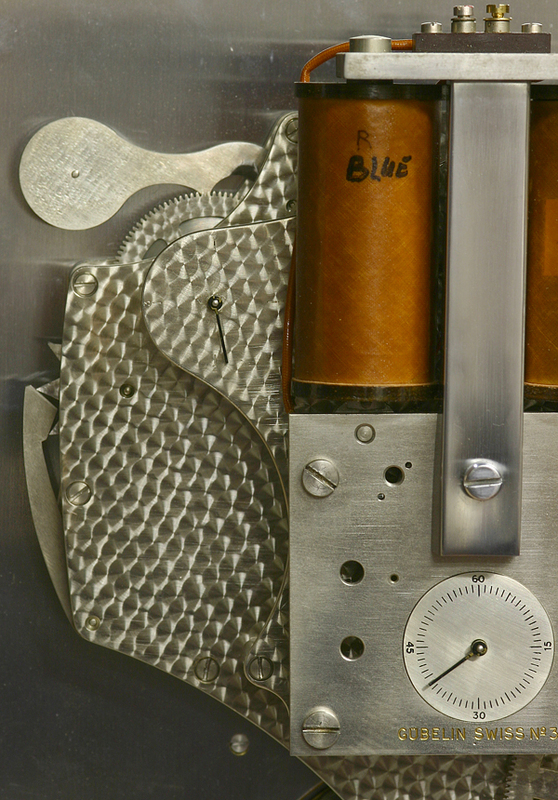 The project was supervised by Frank Lottenbach and the dials were designed by Mr. K. Pfleghart. They stayed in the offices even after he donated his building to the Community Nursing Association in gratitude for taking care of his wife. 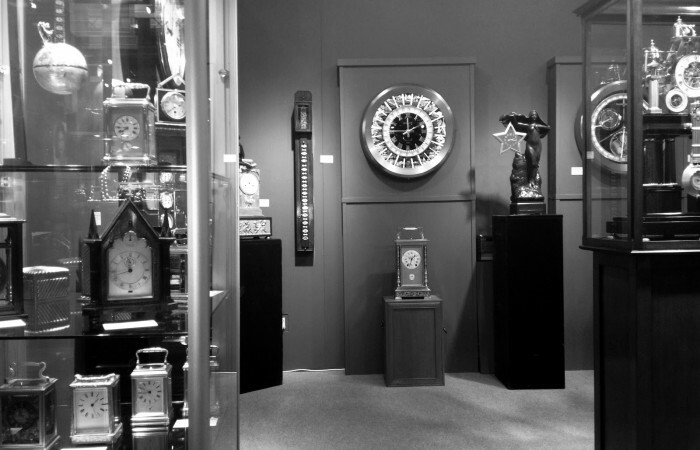 When the Association could no longer take care of the building it and the contents went up for sale and Thomas Whalen, a successful Washington attorney, bought the clocks and proudly displayed them in the lobby of the law offices of Eckert Seamens Cherin & Mellott, LLC. We have copies of both the announcement from Harry Taylor discussing what a rare privilege it is to display the pieces and the informative handout given out at the law offices. Harry Taylor, East Orange NJ. Community Nursing Association, East Orange, NJ. The top segment of the world time has been changed twice. 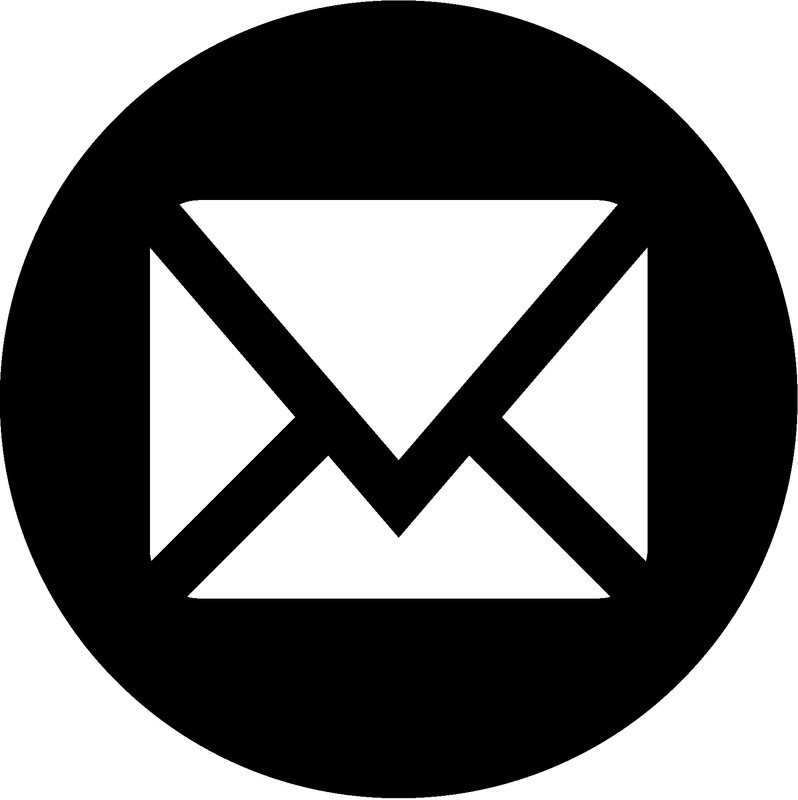 It originally had ‘New York’, ‘Lima’, and ‘East Orange, NJ.’. We still have the Lima, but it is not presently attached and ‘East Orange’ was replaced with ‘Washington DC’ when they were last installed. Unfortunately ‘East Orange’ has been lost.